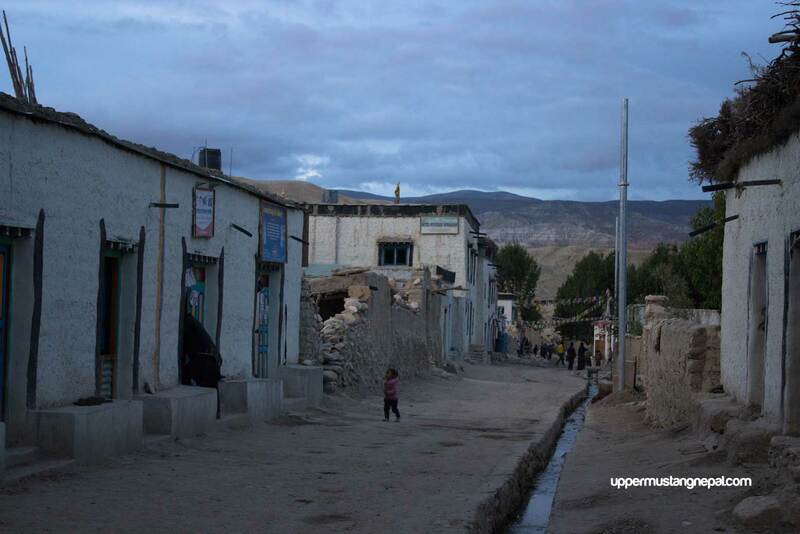 Everyone were curious about the aftermath of the earthquake in Lo Manthang. My friend and I, we decided to go for a road trip. Collect information of The Last Forbidden Kingdom after devastating earthquake, April 25th 2015. My friend and I, one bike, without any support vehicle and 442 km long journey from Kathmandu to Lo Manthang. We made an entire trip in a week starting and ending in Kathmandu. Here is a breakdown of our road trip. 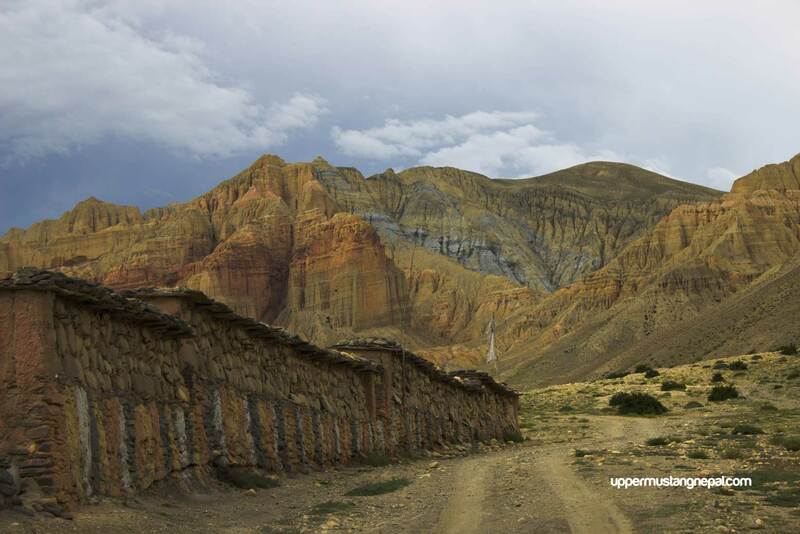 You can browse our upper mustang online map for reference of our road trip. It doesn’t cover portion from Kathmandu to Pokhara. Also hardly cover trail between Pokhara and Jomsom. 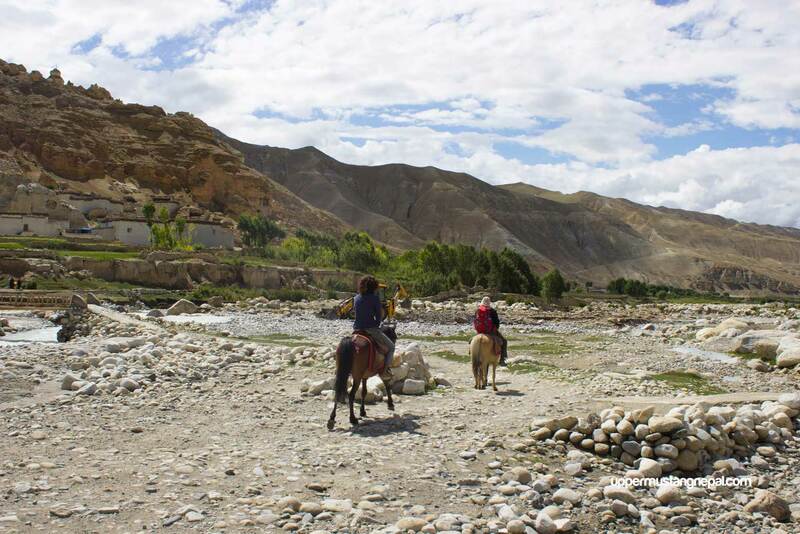 This is because the majority of people start upper mustang trekking from Jomsom, so it is often known as Jomsom Lo Manthang Trek. We had included a tent and mattress for our trip. In Pokhara we stay in a hotel. 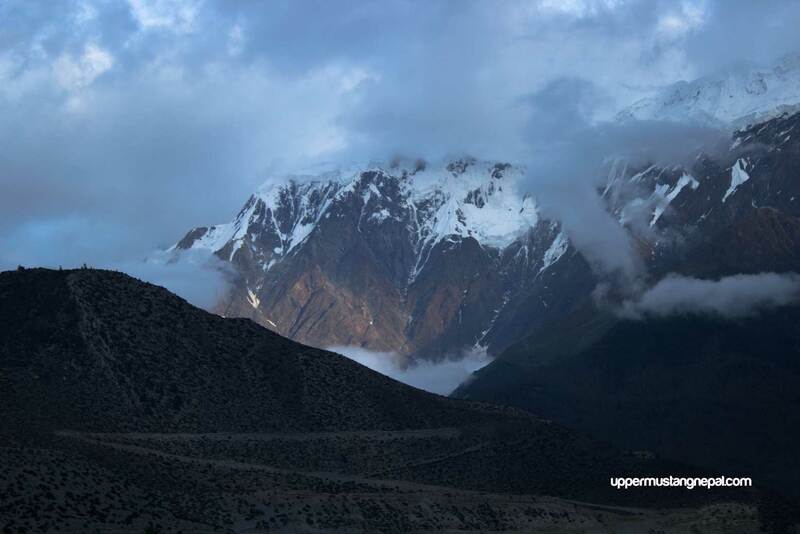 When we reach Jomsom we decide to leave our tent and mattress there and collect on the way back. As monsoon was doing, it works properly, the trail between Beni up to Ghasa was slightly difficult. In contrast to our past trip we find it less difficult. This is because of a raging waterfall. We had to pay USD 5 to local people in one place to get the next side of the big waterfall. Six guys had done a wonderful help. Onward from Ghasa road was beyond our expectations. We were so surprised to find that Mustang had remained intact from an earthquake. We had stayed at Thakali Home in Jomsom. The owner told us that there is completely no need to carry tents and mattress. Next morning after breakfast we start our journey from Jomsom to Lo Manthang. We pass through the village of Kagbeni, locals told us to follow the trail with bridges. It was almost impossible to cross the river. After an hour of ride we encounter with the first group of trekkers before the village of Chusang. On the next to riverbank, many jeeps were waiting for business. 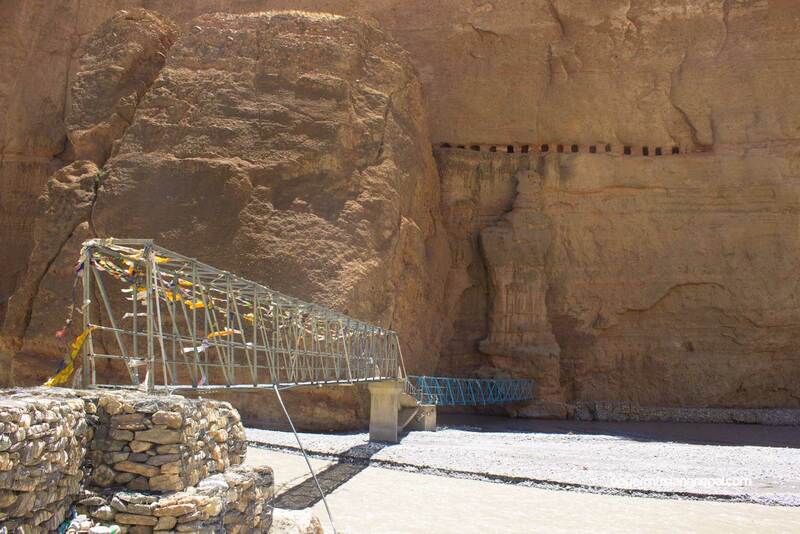 There was a blue trust bridge, right to its entire Kaligandaki river flows through the underneath tunnel of red cliffs. We pass through a few houses and continue our journey. Stopped in Samar Village for lunch. According to owner trail ahead of Samar is difficult in two places. Both near the waterfalls. Huge tractors had devastated the motor road. It was not even accessible by other local jeeps. It was steep up and down, exposed to slides on the right. We had to get off of the bike and try without any hard and fast trail. Sometime we pull and sometimes we push. As a part of monsoon certain portions of the road had turned into a mini river. The majority of road was perfect. We pass through a few villages along the trail. First we encounter with two disappointed photographers! 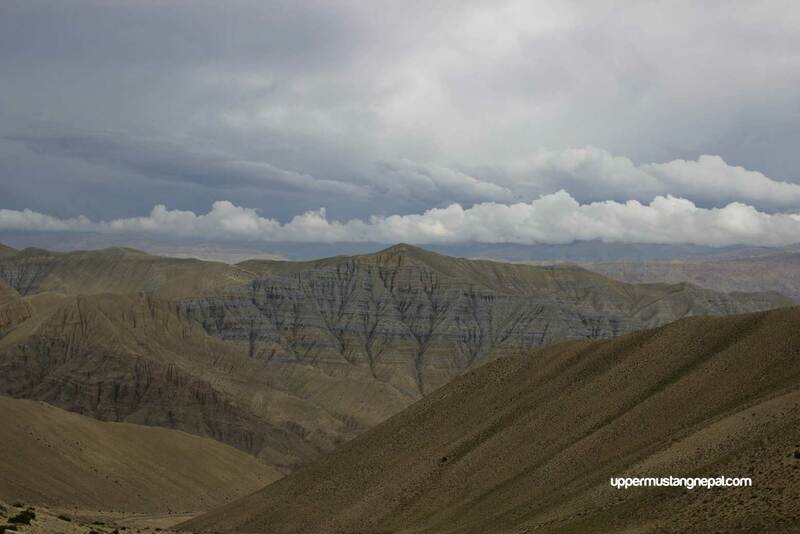 Two photographers from Nepal were in Upper Mustang to take the pictures of barley field. A month earlier, it was too early for barley to bloom. They were waiting for a jeep to Lo Manthang. The clock was about to hit 5:00 PM. Another Tibetan looking woman appears in front of us and ask space for her on a motorbike to Lo Manthang. We were so sorry that we were having a hard time with a backpack. There was almost no space even for us. She was also waiting for the jeep to Lo Manthang but there is no sign of the jeep. She even told us that she needs to go further ahead of Lo Manthang. But there was nothing we could do! Leaving them behind we had to Lo Manthang. As we approach Suganda Chorten, a speeding jeep overtook us. We hope disappointed photographer and Tibetan looking woman get place for themselves on that jeep. Also the pass before Lo Manthang was the high point for motorbike. We took a picture with the bike and Lo Manthang on the background. We found ourselves in front of a colorful Chorten that heralds the arrival of the walled city of Lo Manthang. As recommended by an owner from lunch place, we stay at the Hotel Lotus Inn, Lo Manthang. Three different groups of trekkers, total six of them were in the Hotel Lotus Inn. Two of them were from Switzerland, two from France and two from German. French couple was leaving Lo Manthang tomorrow on their way back. Where as for the Swiss and German it was their first night in Lo Manthang like us. 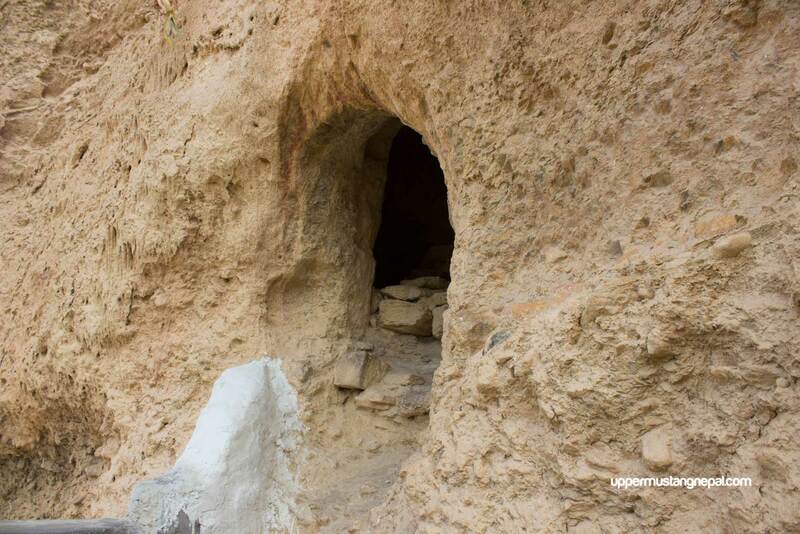 Swiss had a plan to go Chhoser Cave tomorrow, and next day for the village of Yara and Ghara. 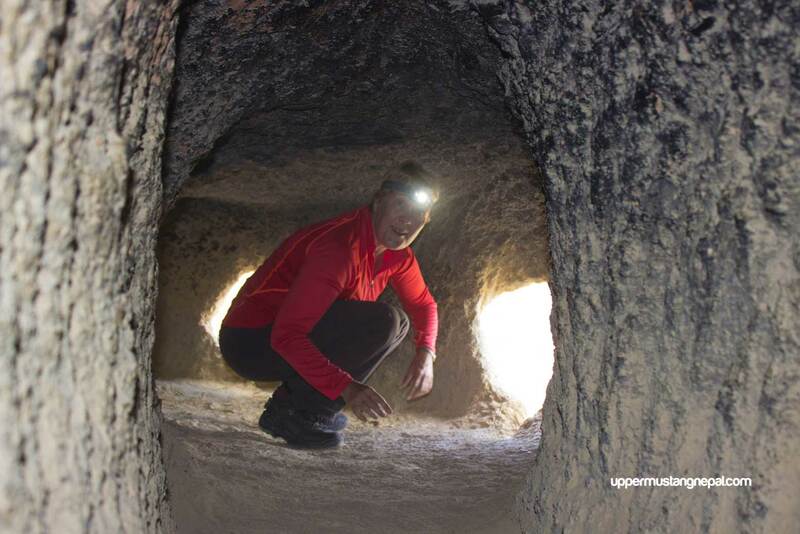 For German they were planning to explore the monastery in Lo Manthang tomorrow and next day trip to Chhoser Cave. Dawa, guide of German couple was very friendly. He told us we could join with them. Two hippies were now adopted by a group of renowned German Operator named Diamir Expedition. 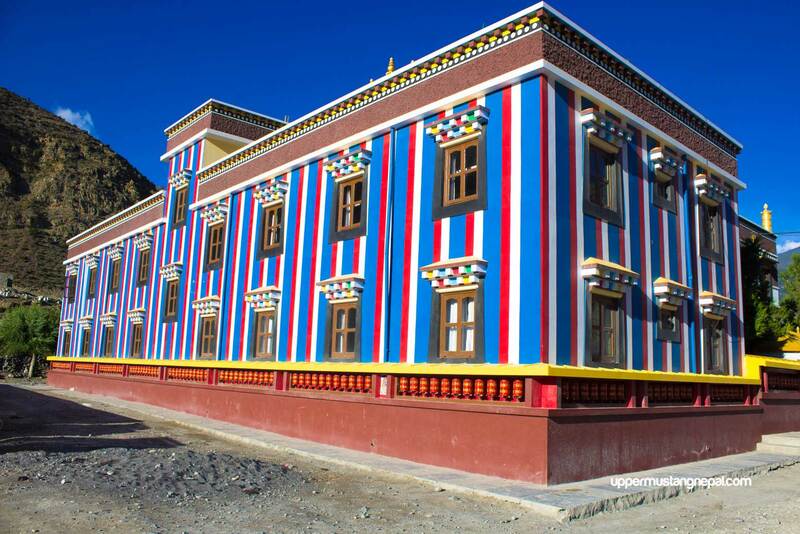 We explore all the major monasteries of Lo Manthang. Also one of the monasteries was being renovated (repainting on the interior wall). A team of painters comprises of few Tibetans and Nepali. Also a guy from Italy was involved. He told us that he has been in Nepal for the past seventeen years. 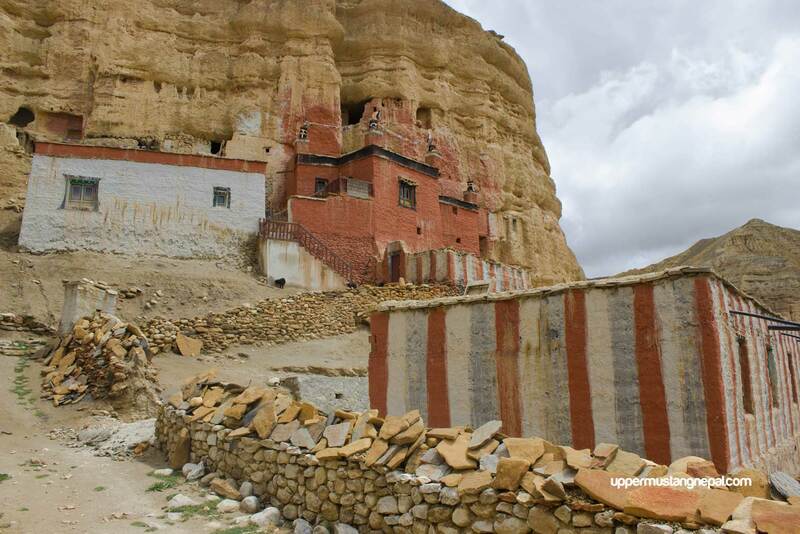 The main entrance of entire monastery was slightly damaged by earthquake. The rest was ok. It is being reconstructed with modern techno. There was a sound of generators, which are being used for reconstruction and repainting. Owner of Hotel Lotus Inn guides us throughout the monasteries. It was a short trip. Our rest whole day in the hotel. When we were in high school, we had a friend named Jigmi Bista. He was from Upper Mustang. We ask about him with hotel owner. 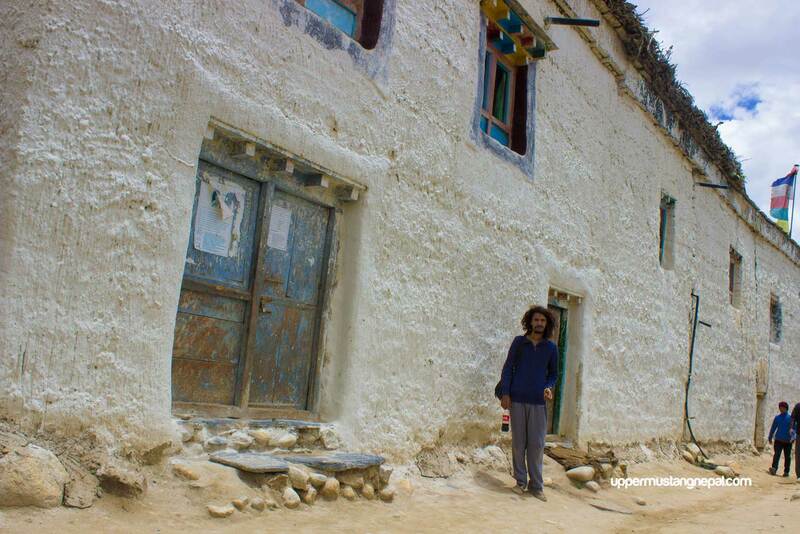 They were relatives and owner told his house is in front of monastery in Chhoser. Place where we were going tomorrow. Five horses were standby! It was five of us in total including German couple and their guide. Two horsemen accompanied us. 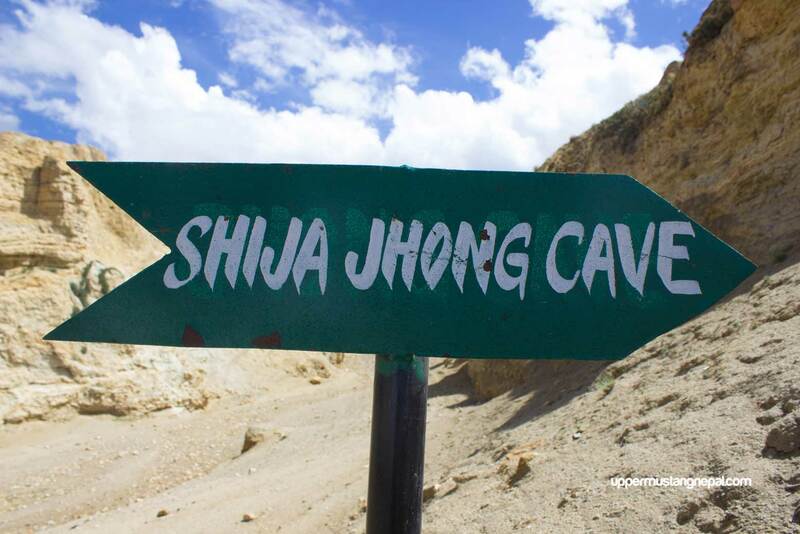 We brought a ticket at entrance of Chhoser Cave. 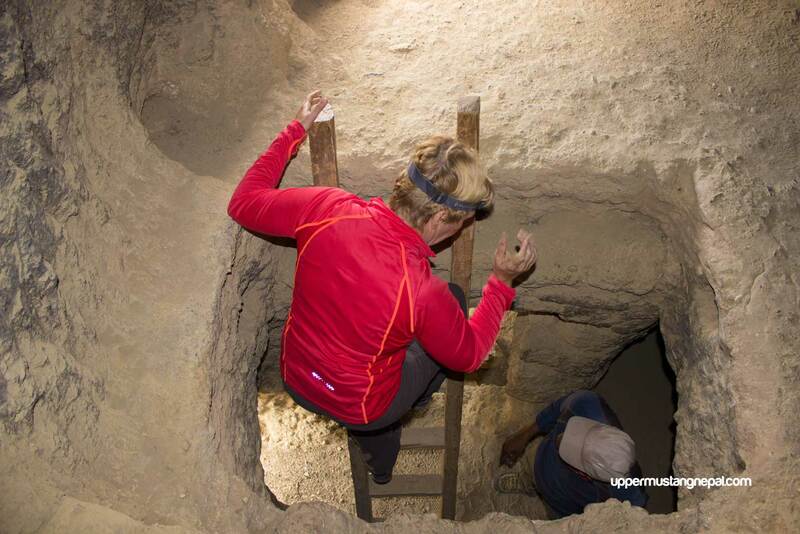 It was an outstanding cave with four different levels and ladder. Later we explore two very old monasteries. Horseman points me, my friend’s house. But none of them, they live there, they were in another village named Marang. We retrace back to Lo Manthang via different way. Oho also a festival named Yartung is being celebrated there. It is a horse race. There is a great race in the afternoon. We can’t participate in that, as we had to return back to Lo Manthang on time. Same day, at almost half past three in the afternoon, we retrace back to the village of Samar. It was very foggy and late. On the way down it is easier to ride. May be because of lower elevation. Also, last two days every afternoon it was drizzling. May be raining more heavily on the lower belt. As expected water level had risen even more than on the way up. It was a long trip back to Pokhara starting from the last forbidden kingdom. Our hotel was next to Busy Bee Café. Large wooden pizza and a sip of Tuborg beer were worth for the dinner. In addition great live music in Busy Bee. And now we were eventually backed to Kathmandu. Busy for managing logistic and other arrangements of upcoming trips. Talking about post earthquake trekking in Upper Mustang, it is totally fine. We heard the monastery is Ghiling is damaged. But as a part of bike trip we don’t explore monastery in Ghiling. 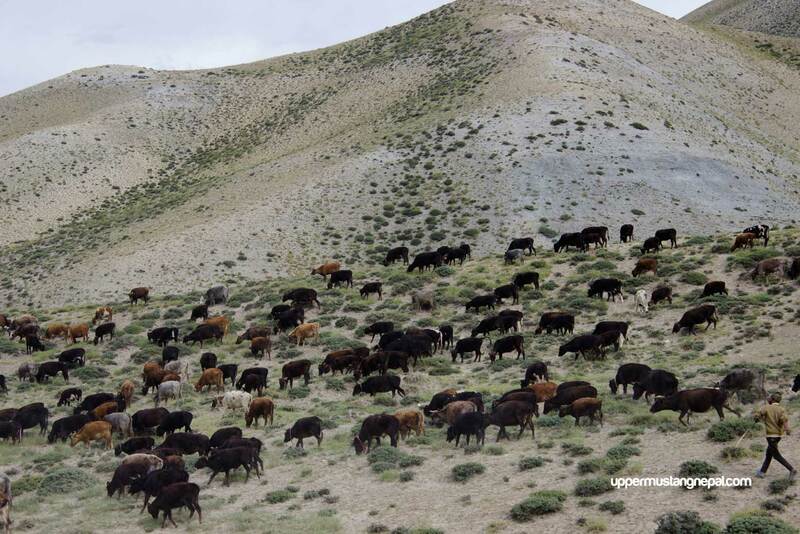 However, the major attraction of Lo Manthang is still alive and magical. 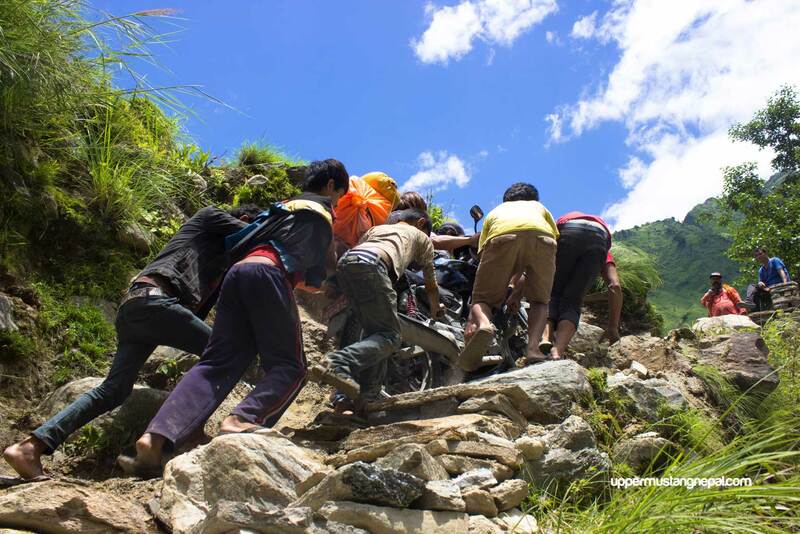 We don’t recommend the overland trip from Pokhara to Jomsom. Go for a Pokhara to Jomsom flight. Onward from Jomsom is still majestic and safe. Want to see more pictures from our journey? 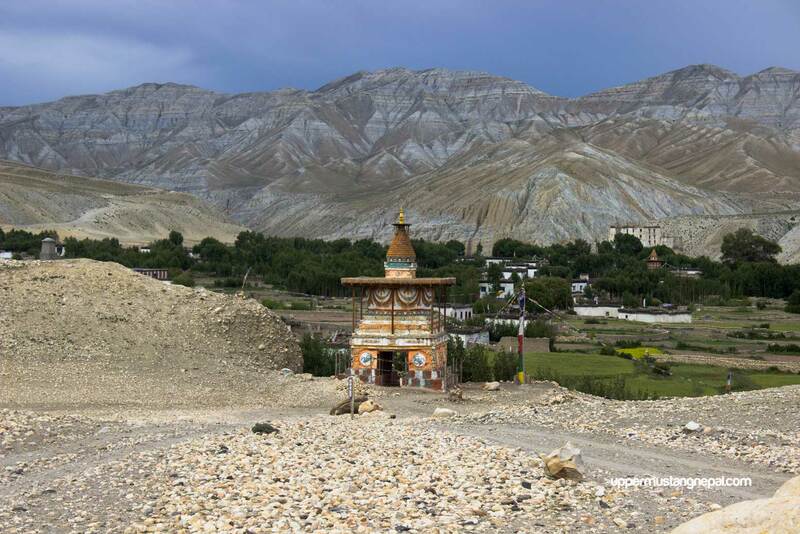 Check our gallery from the post earthquake upper mustang trip.